Our Ultrasonic Pest Repeller uses state of the art ultra-sonic technology to drive roaches and all other pest away, Do you have small children and you are afraid that they might come in to contact with chemical-based roach killers? This ultrasonic repellent is perfect for you. Cockroaches, mosquitoes, mice or something like that can be seen almost everywhere. They are disgusting, insanitary, especially for children. Because mosquitoes transmit malaria, rats may carry the virus and cockroaches spread bacteria. 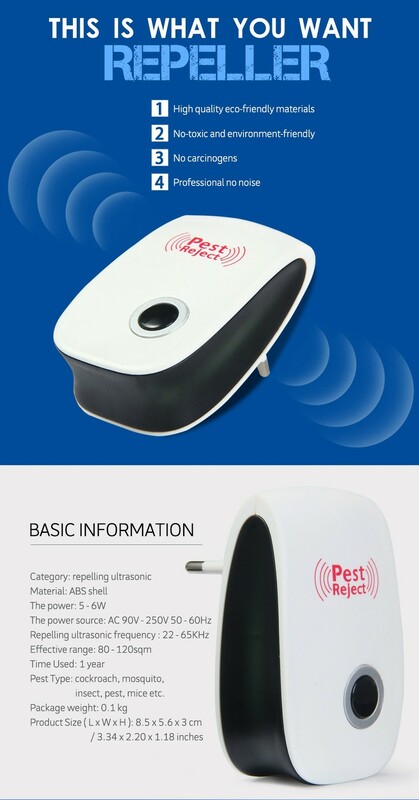 This device is applicable to repel cockroach, mosquito, insect, pest, mice etc. No-toxic and environment-friendly, Safe and odorless. Easy to use,Just plug repellent into the socket and it starts working right away, No Batteries, Assembly or Maintenance required.